Surgical navigation for vestibular schwannoma surgery is the principle of using a computerised based system during surgery to tract the location of instruments. If can be seen as a real time “GPS” system for surgeons, operating on vestibular schwannomas.. It enables the surgeon to acurately plot the location of an instrument during surgery and have it displayed on a monitor superimposed on the images of the patient. 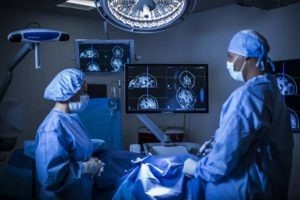 The StealthStation from Medtronic, combines hardware, software, tracking algorithms, image data merging, and specialized instruments to guide the surgeon during vestibular schwannoma surgery. It offers both optical and electromagnetic tracking capabilities. 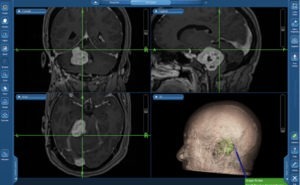 It integrates with external devices like microscopes and ultrasound, a broad array of instrument offerings, and core software applications for neuro and skull base surgery. The position of a tracked instrument in relation to the patient’s anatomy is shown on images of the patient, as the surgeon moves the instrument. The surgeon thus uses the system to ‘navigate’ the location of an instrument. The feedback the system provides of the instrument location is particularly useful in situations where the surgeon cannot actually see the tip of the instrument, such as in vestibular schwannoma surgery. How does surgical navigation work? Surgical navigation for vestibular schwannoma surgery or computer assisted surgery (CAS) creates a virtual image and acurate model of the patient. This can be conducted through a number of medical imaging technologies including CT, MRI, X-rays and ultrasound. To generate this model, the anatomical region to be operated has to be scanned and uploaded into the computer system. This implies that the patient has to go for the planning scan the day before surgery. It is possible to employ a number of scanning methods, with the datasets combined through data fusion techniques. The final objective is the creation of a 3D dataset that reproduces the exact geometrical situation of the normal and pathological tissues and structures of that region. Using the differing contrast levels of the different tissues within the imagery, a model can be changed to show just hard structures such as bone, or view the flow of arteries and veins through the brain. CAS starts with the premise of a much better visualization of the operative field, thus allowing a more accurate preoperative diagnostic and a well-defined surgical planning, by using surgical planning in a preoperative virtual environment. This way, the surgeon can easily assess most of the surgical difficulties and risks, like for instance damage to the facial nerve, and have a clear idea about how to optimize the surgical approach and decrease surgical morbidity. During the operation, the computer guidance improves the geometrical accuracy of the surgical gestures and also reduce the redundancy of the surgeon’s acts. This significantly improves ergonomy in the operating theatre, decreases the risk of surgical errors and reduces the operating time. When removing large or giant vestibular schwannomas, subtotal resection (STR) may be necessary in order to avoid damage to normal structures adjacent to the tumour. Tumours often distort and displace normal anatomical structures putting them at risk of damager during surgery. It is difficult for the surgeon to acurately quantify the precise amount of tumour removed. This is the reason why removal of vestibular schwannoma is most commonly described as gross total removal (GTR), near total removal (NTR) or less than 5% tumour left or sub total removal (STR) or more than 5% tumour left. Utilizing CAS with the StealthStation allows the surgeon to plot and record in different dimensions the extent of tumour removal. It is more accurate than a 2D post operative image or a subjective judgement by the surgeon. We embrace and will continue to explore and use all technology that will aid us in getting better surgical results.